How do you guys feel about copycat recipes? I’m about to give you a good one: Copycat Chipotle Steak Burrito Bowl! My journey on Keto in the last 17 days has been up and down. At this point in the journey, I haven’t lost any weight, but I’ve lost a whopping 10 inches. I will say that I’m not perfect keto. I’m not lazy keto, or dirty keto either. 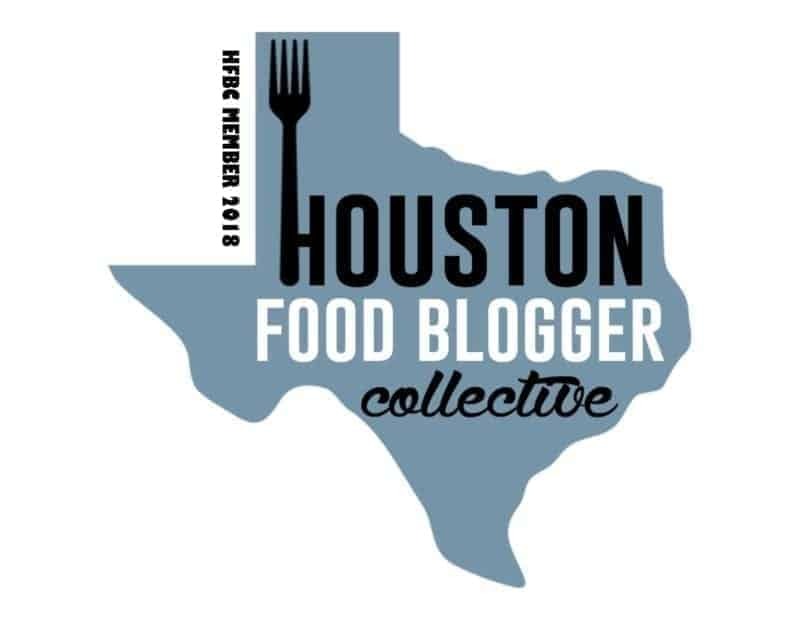 I’m highly imperfect keto. Today is the first day I actually really cheated on the diet (with some AMAZING fries – I’m sorry Keto police, but fries are amazing.). I don’t feel bad about it either. I’m hydrating, and keeping my peace. I started walking for 30 minutes a day on my lunch break, and pushing myself to do more difficult activities. 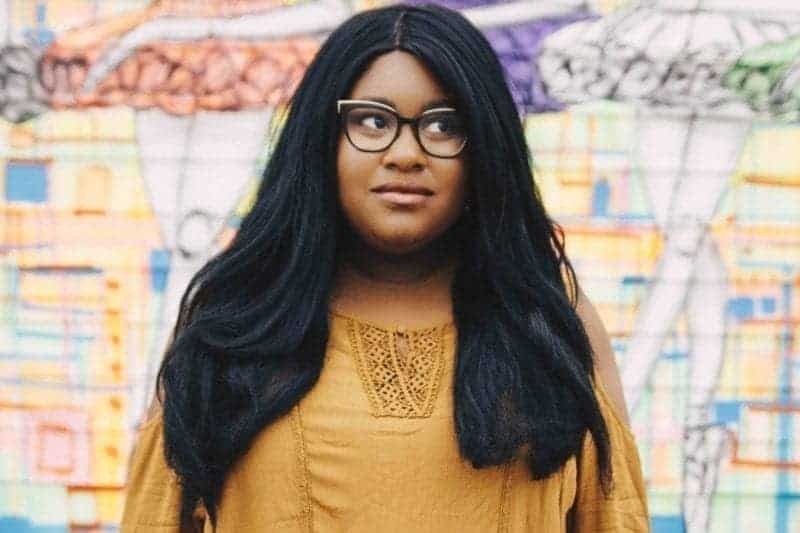 In short – I’m perfectly okay with my journey on Keto. Anywho! Anyone else notice the explosion of diet friendly restaurant entrees? There’s something for EVERY diet. Recently, Chipotle announced their lifestyle bowls (which, let’s face it, customers have literally been doing this forever), where you can get a bowl made specifically for the diet you’re following. They have a great version for the Ketogenic Diet. In this post, though, I’m taking you through the recipe for my personal favorite way to make a Chipotle Burrito Bowl. 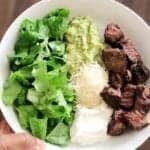 Because of keto, the ingredients are less lax, but this Copycat Chipotle Steak Burrito Bowl is so delicious and completely simple. That’s the thing I love about the keto diet. I love complexity, and feeling surprised about my food. But I also enjoy cooking with simple, delicious ingredients and enjoying a good meal. 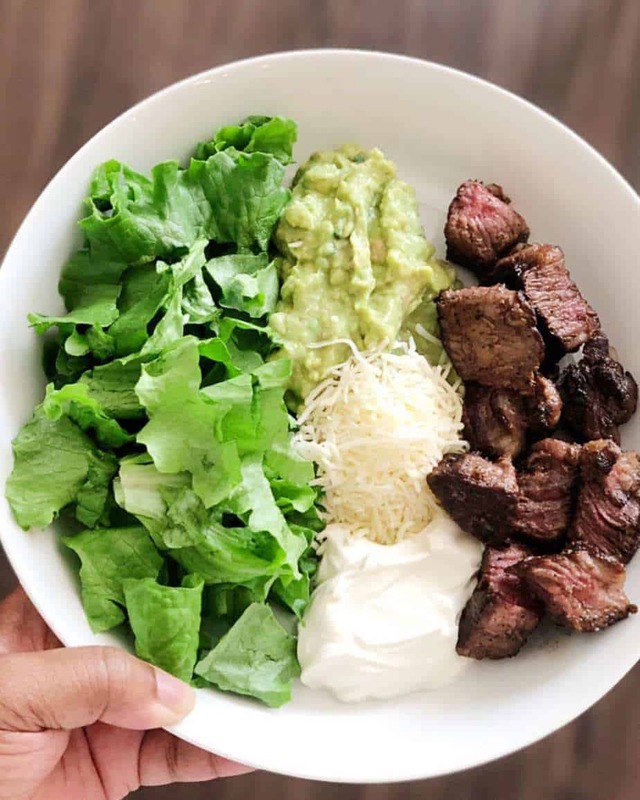 So I hope you guys check out the recipe below for this Keto Friendly Copycat Chipotle Steak Burrito bowl. I also hope that you enjoy the simplicity of this dish. I know it’s one of my favorites. I love this recipe because it’s simplistic, delicious, and easy and you can stay home! Season your steak with salt and pepper. Let the steak come to room temperature before searing it. Before cooking, season with ancho chile, garlic powder and cumin. Heat oil in a pan (on medium high heat), and place the steak in. Sear on all sides until golden brown on the outside. Turn the stove down to medium low heat, and let the steak cook through to your liking (medium is my preference). Once cooked, take the steak out of the pan and let it rest. Work on assembling your bowl- rip up your lettuce and add it to the side of your bowl. In the center, place in half of your avocado (and mash it), the Monterrey Jack cheese and sour cream. Lastly, cube your steak and place it in the bowl. Mix and match your bites, and enjoy! The perils of being a creative.